"Wes" Montgomery (1923 - 1968) was an American jazz guitarist. He is widely considered one of the major jazz guitarists, emerging after such seminal figures as Django Reinhardt and Charlie Christian and influencing countless others. 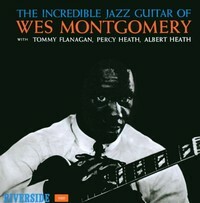 Montgomery was known for an unusual technique of plucking the strings with the side of his thumb which granted him a distinctive sound. He often worked with organist Jimmy Smith, and with his brothers Buddy (piano and vibes) and Monk (bass guitar). His recordings up to 1965 were generally oriented towards hard bop, soul jazz and post bop, while circa 1965 he began recording more pop-oriented instrumental albums that featured less improvisation but found mainstream success. His later-career guitar style is a major influence on fusion and smooth jazz.